Some nurses said they didn’t see the bruises on my arms. That’s a complete lie – everyone that saw me in the hospital said they saw my bruises. There is no doubt that Darlie had large, red/purple bruises on her inner right arm when photographed at the police department on 6/10/96. However, all medical personnel testified that there was no swelling, redness, or even the early stages of bruising while she was under their care from June 6th to June 8th, a total of 2 1/2 days. Dr. Dillawn examined Darlie’s arm every day, including the day of discharge, and saw no evidence of blunt trauma. Shook: And is that something you look for in your examination of her? Dillawn: Yes. If I saw that on somebody’s arm, I would probably want to x-ray their arm. Shook: Any time on the 6th, did you see any evidence of that type of injury to her right arm? Shook: Now, if that blunt trauma had occurred on June 6th, about 2:30 in the morning, 1996, would you have seen evidence of that injury on her right arm, Doctor? Dillawn: In my opinion, yes. This is a lot of blood, yes. Dr. Santos: To get that type of bruising, you usually see evidence of it within 24 hours. I would say that injury is 24-48 hours old. Christopher Wielgosz (nurse): There was no bruising or swelling that would be consistent with blunt trauma. Even a few hours later, I would have seen the beginning of it. There would have been a large amount of localized swelling at the site that the trauma took place, and it would have then taken 24 or 48 hours for it to become apparent. Jody Cotner (nurse, trauma coordinator): I didn’t see any injury that would cause that type of bruising. Absolutely, I would have seen evidence of blunt trauma if it had occurred at 2:30 AM on June 6th. Diane Hollon (nurse): There was nothing on her right arm that would leave this type of bruise. Paige Campbell (nurse): When I bathed her right arm, I had to move it around. She never complained of any pain in her arm. Darlie had a much smaller bruise on her left arm. It was consistent with the arterial line that had been in her left wrist. This bruise was turning yellow/green on 6/10. The right arm bruises, however, were red/purple on 6/10 – fresh bruises, inflicted within the last 48 hours. (Incidentally, Darlie had no I.V.s in her right arm; both I.V.s were in her left). Dr. Vincent DiMaio testified for the defense. Inexplicably, he claimed that the bruises on both arms were the result of blunt trauma on 6/6, even though the coloration was significantly different. Caught in this contradiction, he then admitted that the right arm bruises could have happened on June 8th. The “everyone” that Darlie claims saw those bruises in the hospital were limited to her family and friends. Their testimony was strongly influenced by one of Darin’s relatives, who sat in the courtroom and took extensive notes of the testimony by prosecution witnesses. She then shared that information with friends and family members who were slated to testify for the defense. More about this in Myth 12. Karen Neal, a friend and neighbor of the Routiers, appears to be the only defense witness who was honest about the bruises, although it may have been inadvertent. She pointed to the outside of the arm where Darlie’s cut was, where you’d expect to see some redness, rather than to the inside. Shook: Was she cut on this side of the arm also? Neal: Yes, she had sutures right here. Shook: And this bruising was up and down, near that same area? Not only was the timing off, but even the appearance of the bruises didn’t support a struggle. Alan Brantley: Because of the nature and symmetry, they certainly didn’t look like anything that was coincidental to a struggle or being grabbed. It looked like either the arm had been beaten on something, or something had been beaten onto her. Shook: You’ve treated people with bruising as if they’ve been grabbed hard or something like that? Shook: Maybe a man grabs a woman and pulls her around. Will that leave bruising? Santos: Yes, it can. It depends on whether he grabs her with his bare hands on the forearm, he can leave the imprints of his fingers and thumb. 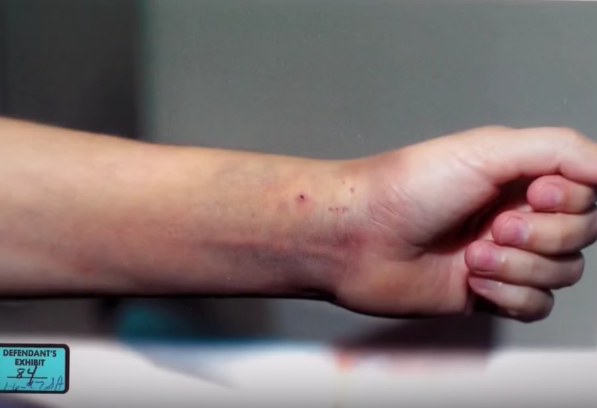 Shook: As far as the injury to Darlie Routier’s right arm, is it that type of bruising? Santos: No. The bruising you showed me in those photographs appear to be more of a deep bruise. Shook: Again, what we call blunt trauma, something striking the arm? As bizarre as it sounds, the right arm bruises were inflicted by Darlie, or perhaps a family member, sometime after she was discharged from the hospital to bolster her claim of being attacked by an intruder. Now, do bruises appear at different times on different people? Sure, although four days is quite a stretch. However, when those bruises appeared isn’t nearly as important as what was not seen in the hospital: no redness, no swelling, no discoloration, not even the beginning stages of bruising. It is inconceivable that every single doctor and nurse, including the M.E. who checked her injuries, would not have seen such severe blunt trauma if it existed. In addition to the late, late blooming bruises, there were a few other incidents which indicate that Darlie knew she might be on the police radar. 1. The police took photographs of Darlie’s injuries on the afternoon of June 6th. Dr. Dillawn stated that she was “a little bit agitated about why they wanted to photograph her wounds.” This is a bit odd, considering that only three pictures were taken, and the procedure had been explained to her beforehand. Shook: Was Mrs. Routier given Xanax in the hospital? Santos: Yes, here it is [on the focus notes]. 6-6-96 at 16:45 which is 4:45 pm, she was given .25 milligrams of Xanax, to decrease her anxiety. Shook: And can you tell the jurors the entry before that, on 6-6 at 4 pm? Shook: And that’s at 4 o’clock? Shook: And then at 4:45 she needs Xanax for anxiety? 3. Barbara Jovell visited Darlie in the hospital on June 7th. Shook: Did Darlie make a request there in the room? Jovell: Yes, she asked for everybody to leave the room but for me to stay behind. Shook: And then what happened? Jovell: She told me that she had sexual toys in the house and that the police were going to see them. Indeed. Why would a mother, whose two little boys have just been slaughtered, be worried about what the police might find in her house? Or having her injuries photographed? Or being upset about a newspaper article? Sure, it could be one gigantic coincidence. But consciousness of guilt is a distinct possibility, too. Author Barbara Davis’s book, Precious Angels, came out in 1999. In it, she left no doubt in anyone’s mind that Darlie Routier had murdered her sons. But then, just a few months later, something strange happened. Barbara Davis began appearing on talk shows, claiming that she had been wrong, that Darlie was actually innocent. Vague accusations of prosecutorial misconduct and cover-ups were made, but never supported with any evidence. Most of those baseless allegations have fallen by the wayside over the years. Fact: Both the prosecution and the defense showed numerous photos of Darlie’s bruises to the jury. Multiple witnesses, including Drs. Santos, Dillawn, and DiMaio, were questioned extensively about all of her injuries. Shook: Where does this bruise extend from? Dr. Santos: It appears to go from her wrist to right below where her hand is, past her elbow, up toward, almost into her armpit. Shook: Okay. And then 52-E, that’s an even more close-up photograph of that bruise? Shook: If you could take these two photographs and go along the jury rail so all the jurors can see. Mulder: Admit Exhibits 82 through 92. The ones in the hospital are June 6th, the Polaroid is June 6th, and the rest are June 10th. Could you come up here so that Richard and John, maybe, so we can show the jury the various photos that we’re talking about? Damaging Barbara Davis’ credibility even more is the fact that she had graphically described Darlie’s bruises on page 306 in her book: “Blunt trauma was responsible for solid and massive bruises covering the underside of Darlie’s right arm extending from the wrist all the way to the armpit.” How could she describe those bruises and then, several months later, claim that she never saw them? Even Doug Mulder, Darlie’s defense attorney, stated in a televised interview that the photos were shown at trial. How would Barbara Davis know what photos the jurors looked at? How would she know that “they” made sure they were mixed in? How would she know that the jury did not look through the evidence? She wasn’t in the deliberation room.